The is a particular vision of astro beauty that I am chasing. Not surprisingly, it includes the aurora, dancing in the skies above me - something I have been privileged to have witnessed many times in Northern Ireland. But this dream involves another ingredient found only on the coldest of cold aurora chasing nights - a snowy landscape below a starry sky above. I have visions of the vivid colour of a large aurora casting its eerie green glow on the gently undulating snow drifts in the fields in front of me. I have come close, once before. But, to me, it was only a taster of what I'm really after. I can see it in my head; and it looks awesome. So, when there's even the remote chance of realising this dream, I have to spring into action. 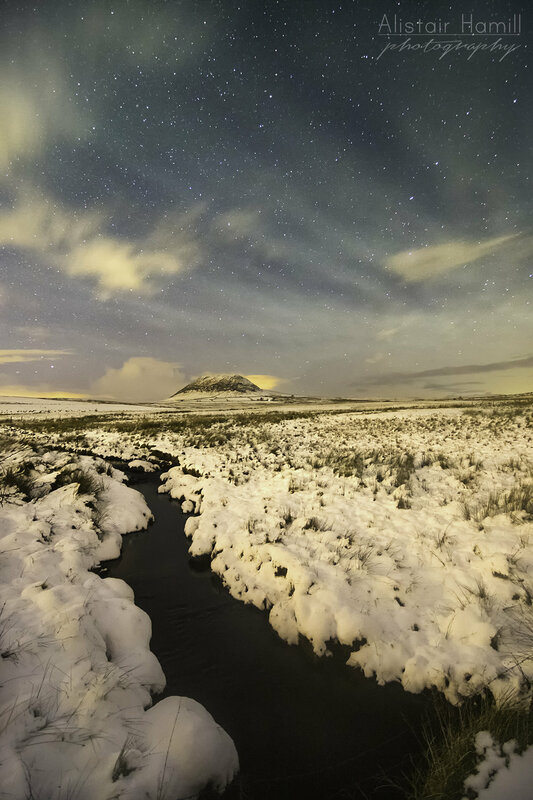 And so it was on a Monday evening early in December, with the snow lying fresh on the ground, with clear skies forecast for the heavens above, and with the chance of an aurora making an appearance at some stage, that myself and fellow astrophotography buddy Johnny Baird set off towards a favoured hunting ground at Slemish. The roads were ice rinks. The journey up was challenging and involved more than one spin of the wheels on ground that simply refused to give up any semblance of traction. But carefully and slowly we wove our way to the little brook that flows off the flanks of this ancient volcano. The skies, as promised, were crystal clear and the stars quietly got on with their famous twinkling overhead. The snow was glistening with a sharp frost that had descended with the night, reflecting back so much light that we could see so clearly, even on this moonless night. And there wasn't a breath of wind; the only sound to be heard was the gentle gurgling of the little brook, as the water that had managed to escape the icy grip of winter tumbled and frolicked downstream. All we needed was for lady aurora to come out a dance for us. But she was playing hard to get that night. So hard, that it seemed that she hadn't even put her party dress on, never mind started to spin and twirl above us. However, sometimes when the main act doesn't cooperate, it gives room for another character to emerge into the limelight. For, in the skies above, there was another celestial light display going on: airglow. It was an amazing display in September at the Giant's Causeway that first made me fall for airglow. Too often seen as the aurora's ugly sister ("That's not aurora, it's just airglow"), in actual fact this is a thing of tremendous beauty all in itself. Okay, so it may not reach the dizzying heights of an amazing aurora display. But that night at the Causeway I got to see what a proper airglow display looks like. My only regret that night was that I wasn't able to shoot a timelapse video. Just how dynamic are those ripples, I wondered. And I resolved myself to find out the very next opportunity I got! So, when I spotted the waves of airglow in the sky that night, I didn't need asking twice! Up went the camera, the intervelometer was set, and we stood back for the next hour whilst my camera did its work, enjoying looking out for a few early Geminid meteors in the starry skies above. So here I present my very first airglow timelapse. And, if you've never yet seen just how much it moves across the night sky, then sit back and enjoy the aurora's ugly sister in all her glory! "Not So Dark After All"
If you're interested in finding out more about what airglow is and how it occurs, check out my free mini eBook, "Not So Dark After All".